So the family is headed to DC for our annual “show the kids a new great American city” trip, and I was on Hotels.com looking for hotel rooms today. First of all let me say, I love DC and I love Hotels.com. I travel to DC often for business and Hotels.com is my go to travel booking site. But I noticed something today in my search results that I’d call an epic marketing fail. See below. Umm, no thanks. I’d rather pay the $381 for a room at the Westin Hotel DC than your amazing offer of $2,075!!??? WTF is that? 1) It looks plain ridiculous for a hotel to have their low organic rate showing up right next to their “special” advertisement (they are paying for that remember) when the price is literally offensive and..
3) The whole point of using a site like Hotels.com or Travelocity is to find cheaper & discounted rates. I would think they’d have a rule in their search algo to never show prices above a certain level – say $1,000 per night – as it just looks ridiculous and not a usable search result for a user. Hello? 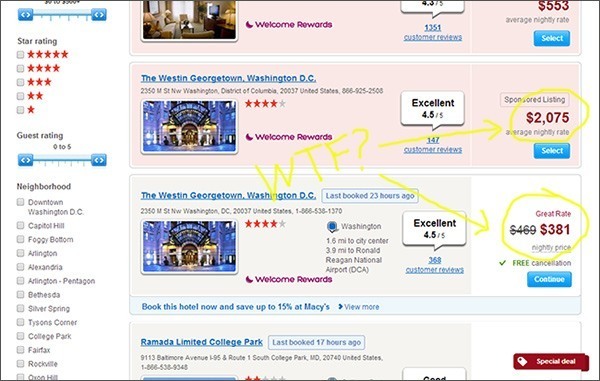 Whoever is in charge of sponsored listings at Hotels.com needs help, and they need to tweak their algorithm. And whoever at Westin Hotels is paying for these ads needs to have a talk with their account manager asap.